For just $110, the Nike PG2 is an insanely good on-court performer according to a significant number of buyers. They just love everything these basketball shoes have to offer. Despite being cheap on paper, nearly all testers agree that the materials work really well. It’s flexible, durable, breathable, and requires little to no break-in time. A lot of wearers praise how comfortable these Nike basketball shoes feel. Many users just really enjoy wearing the PG2. They are saying that it is comfortable to wear all day, every day. 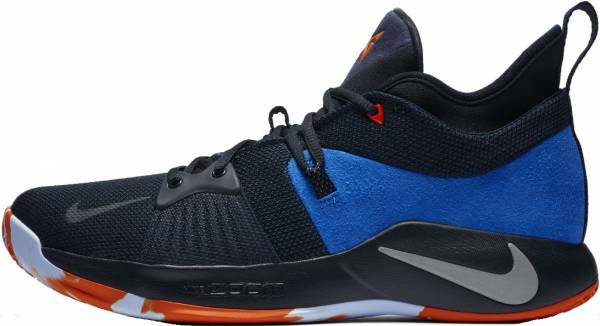 Like the Nike PG 3, these Paul George basketball shoes are very supportive and have excellent lateral stability, several testers remark. Most reviewers are surprised that the Nike PG2’s traction bites the floor really well. They are saying that it is even better than the PG1. The cushioning also improved, many testers are claiming. The PG2 is more responsive and has more bounce to it than the Nike PG1. A good number of users are happy that these Nike basketball shoes are true to size and wide-feet friendly at the same time. The lockdown is fantastic, most players report. A lot of buyers just don’t dig the Nike PG2’s silhouette. They claim that it looks like a child’s shoe. Some players are reporting that the cushioning feels underwhelming and it provides a rough ride. A few wearers are complaining that these Paul George shoes run narrow and feel really tight. Players have a similar complaint regarding the Harden Vol 3’s fit. Most testers are warning that the PG2 is meant for indoor hooping. They observe that the outsole is soft and frays easily. Overall, the Nike PG2 is a solid on-court performer and arguably better than the first. Everything about these basketball shoes just works, and all the performance-oriented enhancements are on point. Right off the bat, wide-footers feel the improvement with the shoe’s fit. Players also welcome the enhanced cushioning and traction. So, if you liked playing in the Nike PG1, then the PG2 is right up your alley. Better than the original is the best way to describe the Nike PG 2. Yet again, it will be a front runner for top shoe of the year. Not the best, but best all-around (and at $110). Regarded as one of the league’s best two-way players, Paul George needs a basketball shoe that can keep him focused on both ends of the floor. His second signature basketball shoe does just that. With performance updates to bring his game to the next level, the Nike PG2 is made for the game’s most versatile athletes. These basketball shoes have a light yet durable upper that delivers enhanced comfort and containment while its updated Zoom Air cushioning responds to your every move. Cushion. The Nike PG2 has a soft foam midsole with a low-profile 10-millimeter Zoom Air unit to provide a smooth, responsive, and stable ride all game long. In the forefoot, the larger Zoom Air bag offers increased on-court responsiveness and comfort to keep your every step lightning fast. A 6mm foam sockliner is also designed to enhance underfoot comfort. Traction. The Nike PG2 has a full-length rubber outsole that features an updated traction pattern to deliver improved grip on a variety of surfaces. This new and improved traction allows you to move quickly on both ends of the court. The outsole also has pistoned zones that flex as you move. Length and Width. Reviewers agree that the Nike PG2’s fit is true to size. Normal, narrow, and wide-footers are suggested to order their exact size. However, it is still best to give these shoes a try in-store to get the right fit. Lockdown. Nike decided to forego the forefoot strap that was used in the PG1. Instead, the new dynamic wing design of the Nike PG2 keeps your forefoot secure and locked in. These forefoot straps are engineered to provide you with much-needed stability during quick changes in direction. The PG2’s lacing system also feed through these mesh bands to deliver a locked-in feel. Extended lace loops, an updated traditional tongue, and an inner collar offer a more dynamic fit. Depending on the Nike PG2’s colorway, the upper is made of either mesh, synthetic, and/or leather materials. The mesh provides a lightweight feel and enhances breathability. An inner sleeve wraps your foot to provide unparalleled comfort while a thick sockliner offers a plush feel underfoot. Nike designer Tony Hardman returned to create the second iteration of Paul George’s signature sneaker. During the design process, George and Hardman came up with five guidelines to ensure that the Nike PG2’s influence extends to both basketball and sneaker culture. The PG2 now boasts a sleeker design than its predecessor. Without the prominent forefoot strap, these signature Nike basketball shoes allow you to be faster on your feet. Signature details include George’s PG-13 logo that can be seen on the insole, tongue, and heel tab. An inverse Nike Swoosh caps off the shoe’s sleek silhouette. Despite building so much hype around the PG2’s launch colorway, Nike only released a few other hues before unveiling the PG 2.5. The Swoosh also released a handful of PE colorways for Nike-sponsored events such as The Academy and EYBL. After Demarcus Cousins suffered a season-ending injury, Paul George was named as his replacement in Team LeBron in the 2018 NBA All-Star game. To mark the occasion, Nike added the PG2 to their 2018 All-Star collection. The ‘All-Star’ colorway looks to George’s hometown of Palmdale for inspiration. Grey represents the desert, orange for the sunset, and green for the nature around the area. These Paul George basketball shoes also feature a custom graphic on the sockliner and five purple PG logos on the heel to commemorate each of his All-Star selections. Nike released a special edition PG2 to celebrate “Mamba Day” 2018. Taking inspiration from Bryant’s Prelude Pack, these Paul George basketball shoes are dressed in Cannon, Volt, and Purple Venom. The heel is adorned with a unique graphic that illustrates some of George’s hobbies such as fishing and chess. The Nike PG2 ‘NCAA’ made its on-court debut during the 2018 NCAA Division I Men’s Basketball Tournament. Sharing a similar color theme to the “Net Collectors Society” Pack from 2016, the ‘NCAA’ colorway features a simplistic white upper with black accents. Finishing off the March-Madness-inspired theme is a multicolored outsole. Featuring graphic prints inspired by the PlayStation controller buttons and a light-up tongue, the Nike PG2 ‘PlayStation’ colorway perfectly connects two of Paul George’s passions. Nike is celebrating Paul George’s birthday by launching a zodiac-inspired colorway of the PG2. Dubbed the PG2 ‘Taurus,’ these basketball shoes feature a combination of black, white, and sola red. The Taurus constellation is placed on the left tongue to complete the design. It is no secret that Paul George’s favorite hobby is fishing. So, as a nod to his off-court pursuits, Nike launched a clean white-based edition called ‘The Bait II.’ This colorway features a white upper with OKC-inspired blue and orange accents. An icy translucent outsole completes the shoe’s silhouette.